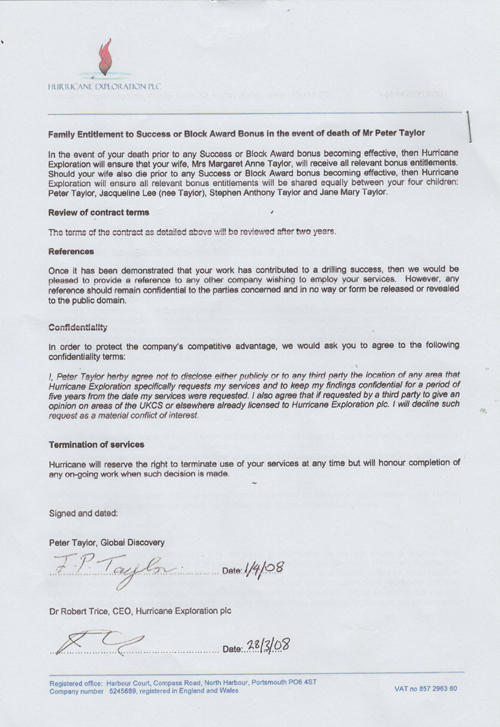 I worked for Hurricane for 4 years under 2 contracts parts of each are shown below. Hurricane was satisfied wtih the work that I did at the time. I did locate several fields on the mainland of Britain for them over the time I was with them. 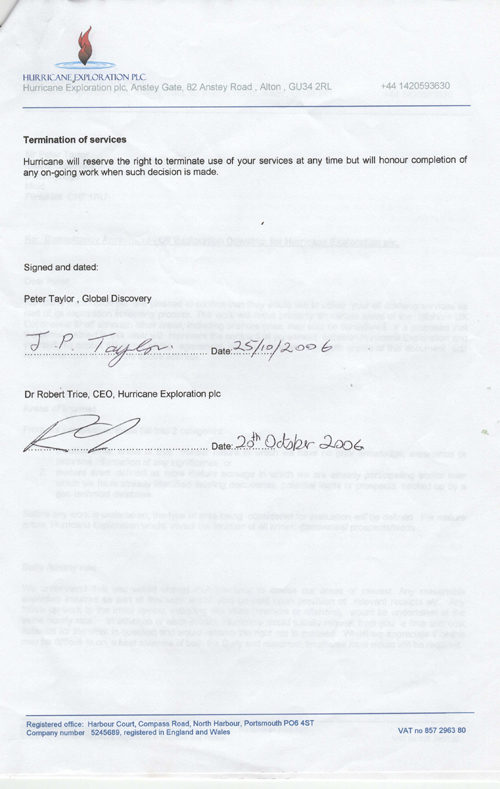 My Contract with Hurricane started in 2006 which was a 2 year contract followed up by a second period extending to 2008. 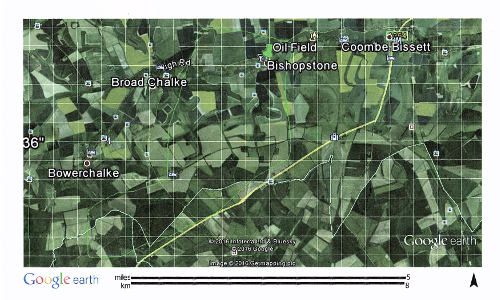 In 2006 to 2007 I did quite a bit of work locating potential oil fields for the Company first of all by remote surveying then as usual on site when I located a potential oil field west of Salisbury in the area of Bishopstone. I worked out the depth and quantity recoverable which at a later date I was called down to Salisbury to work on site as this improves the accuracy to locate the potential field together with the geologist of the Company. I was informed that 2 million to 3 million barrel would be financially feasible. This particular field was indicating a capacity to recover over 10 million barrels from the site. Unfortunately they decided not to go ahead with this particular site as they felt they could pursue and get larger volumes in the West of Shetlands. 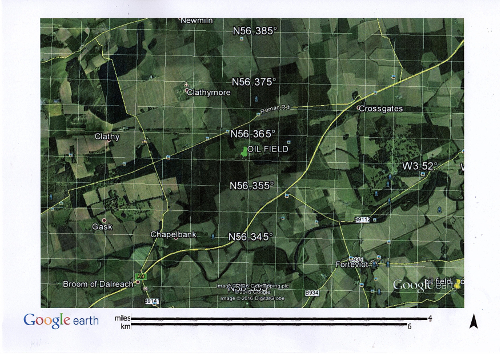 The map above shows the area in question close to Salisbury. About a year later I had also located by remote surveying an area in Perthshire further oil fields which again we were both called out to check the site where I did a depth count and quantity count and checked out for faulting and fractures whilst I was there. It was later confirmed that there was a good volume of oil in that area and in the region that I had predicted on site. A siesmix survey was taken to support my findings which in due course it did and also indicated that it would be financially feasible to raise. I was asked later on to check out the West of Shetlands. First of all on a large planning map bigger than an ordnance survey map. Having said that the map surveying as always only gives us a guide as to the potential target area, a site visit is always advisable. The Company had already marked out some lead on the plan and I was asked to check out these sites which I duly did. Some of the sites were indicating oil to me but the porosity of the rock in some cases seemed to be poor. On other sites I didn't get a good indicator of oil. I marked out the potential areas that I had a good reaction on. Some were not on their leads but nearby which I had indicated potential oil. Our contract finished in 2010 so I am allowed now to pass my thoughts on. I do believe that if I would have been asked to go out to sea to check those areas I would have picked up the same areas as the Company has as this would of confirmed the oil potential fields like I did in Salisbury and Perthshire. As far as I am aware the field in Perthshire and Salisbury are still free. For those of you oil men who are looking for worthwhile oil reserves I know of plenty in and around the UK itself just contact me.